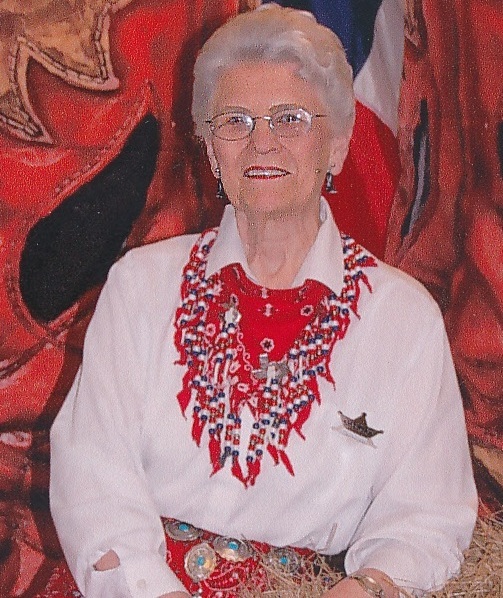 I first learned of Jane Long when I studied Texas History in elementary school. Her story always fascinated me because she did so much on her own and made a success of her life even when tragedy struck her with the loss of two baby girls and her husband. Although she was not born in Texas, Jane Wilkinson Long became known as the “Mother of Texas.” Her story is one of courage, resilience, and tenacity in the face of tragedy and makes the honor well-deserved. Born on July 23, 1798 in Charles County, Maryland, her childhood was one of tragedy. Her father died when Jane was less than a year old. Her mother stayed there with Jane until 1811 when they moved to Mississippi Territory where Jane’s older sister lived. When her mother died in 1812, Jane went to live with her sister. 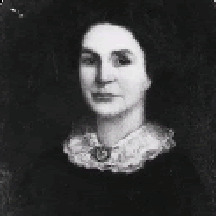 In early 1815 she met a physician, James Long, who had come to Natchez to practice medicine. They married in May, 1815 just a month or so before Jane’s seventeenth birthday. In November of 1816, their first child, Ann, was born. In 1819, after the birth of her daughter Rebecca, she set out to follow her husband to Texas where he hoped to help Texas win freedom from Spanish rule. She fell ill on the way and stopped in Louisiana where she left her daughters in safety so she could join her husband in Nacogdoches, Texas. Before they could return to Louisiana to claim their daughters, Rebecca died. In 1820 the young family moved to Bolivar Point near Galveston, Texas. There they established an outpost in an effort to help free Texas from Spanish rule. In 1821, James left on an excursion to Mexico. Jane was expecting another child, so she stayed behind and vowed to remain there until James returned. James was captured and killed in Mexico City, but Jane did not know this. Throughout 1821 and 1822, she stayed even as others left and supplies ran out. She, a twelve year old servant Kian, and her six year old daughter Anne survived on dwindling supplies of corn meal, salted fish and oysters from the bay. Her ingenuity in keeping the fort safe by giving the illusion of it still being occupied by soldiers protected her and her child from Indians in the area. On a freezing December night, alone with only her daughter and the servant girl, Jane gave birth to her daughter, Mary James Long. They were finally rescued a few months later in March. Jane settled in Fort Bend County, but then Mary died at the age of two. Undaunted, Jane stayed and was offered a land grant by Stephen F. Austin as a part of Austin’s colony. 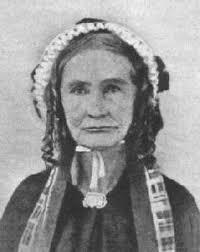 In 1832 she purchased an inn in Brazoria. With the help of Ann and Kian, she turned the inn into a place where prominent leaders of the Texas Revolution met to discuss politics. In 1835 she honored Stephen Austin with a dinner and ball after his release from eighteen months in a Mexican prison. Five years later she opened another inn and developed her land grant into a very prosperous plantation. By 1861 she owned more than 2,000 acres. School children have drawn pictures of her and other Texas heroes through the years. This picture of her in her last years shows the ravages of time and circumstances on her 82 year old face. 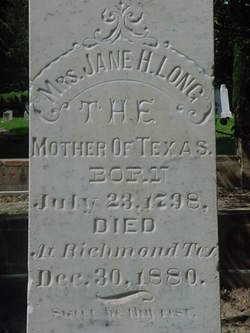 She is buried in Richmond, Texas in Fort Bend County with this simple headstone. Martha Rogers is a free-lance writer and the author of the Winds Across the Prairie and Seasons of the Heart series as well as the novella, Key to Her Heart in River Walk Christmas and Not on the Menu in Sugar and Grits. Love Stays True and Love Finds Faith, the first and second books in her third series, The Homeward Journey, are now available. She was named Writer of the Year at the Texas Christian Writers Conference in 2009 and is a member of ACFW and writes the weekly Verse of the Week for the ACFW Loop. In addition to fiction, Martha has contributed to compilations by Wayne Holmes, Debra White-Smith and Karen O’ Connor as well as various devotion books. Martha is a frequent speaker for writing workshops and the Texas Christian Writers Conference. She is a retired teacher and lives in Houston with her husband, Rex. Their favorite pastime is spending time with their nine grandchildren and three great-grandchildren. I've never heard of Jane Long before, but I loved her story. She's the epitome of surviving and thriving. We could learn a lesson these days from her tenacity. You're so right, Vickie. 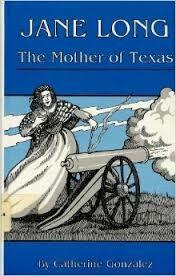 A good reason to have strong heroines in our 19th century stories set in Texas, Oklahoma or Kansas. I am so upset. I had a long comment to you, then when I submitted it to you, it made me sign in(usually doesn't) but then it deleted it. No sense in that. Anyway will just say now that I enjoyed your post. Maxie, I understand. That's happened to me numerous times in the past few months. Thanks for letting me know. Glad you enjoyed reading about Jane. Thank you for sharing this most interesting post. Jane Long was quite a lady!